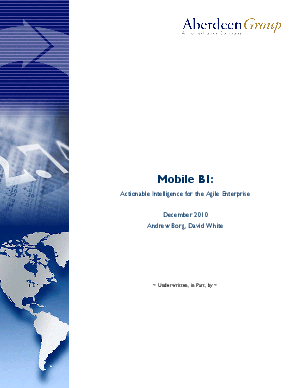 BI usage among organizations with mobile BI has doubled compared to those companies that have not mobilized their BI. By extending the reach and usage of their existing BI infrastructure to mobile devices (through the use of visualization tools such as dashboards, charts and graphs), organizations found they could more agilely respond to market changes and customer needs - accelerating time-to-information and improving customer satisfaction. This accelerates time-to-information for critical business decisions, while improving customer satisfaction retention.